Soap and Birch Body Scrub is produced by the Russian beauty brand Agafia’s Bath. The product is formulated with 100% natural ingredients. It is specifically designed for deep cleansing. 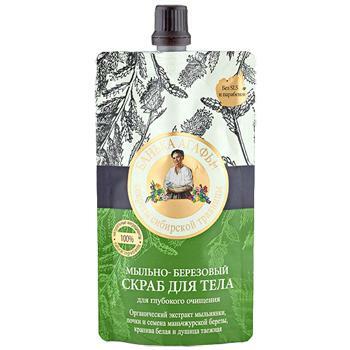 This herbal scrub contains Siberian plant extracts rich in saponins (natural foaming agents). It exfoliates the skin gently yet effectively. The product is made with natural ingredients which do not cause skin dryness or any other problems. Sichuan birch buds and seeds help to remove dead epidermal cells and have an active regenerating effect. White nettle has a rejuvenating effect and stimulates your skin's natural protective mechanisms. Oregano is rich in essential oils, vitamin C and flavonoids. It soothes the skin, makes it soft and smooth. Organic soapwort extract produces a lather when in contact with water, helping to clean your skin even better. Directions. Apply a small amount of scrub onto wet skin with light, circular motions. Rinse with warm water. Ingredients. Aqua, Lauryl Glucoside, Acrylates/Vinyl Neodecanoate Crosspolymer, Potassium Hydroxide; Betula Manshurica Seed Powder, Lamium Album Powder, Origanum Vulgaris Powder, Organic Saponaria Officinalis Extract, Polyethylene, Benzyl Alcohol, Benzoic Acid, Glycerin, Sorbic Acid, Citric Acid, Chlorophyllin-Copper Complex, Parfum. Want to buy Soap and Birch Body Scrub? Call us or submit your order via our web site!